Hurricane Irma brought terrific damage to the Southeast, including to agriculture. Preliminary observations point to considerable losses, but it could have been worse. As assessments begin, agriculture is getting back to work after the storm. Dale McClellan owns and operates a dairy about an hour north of Tampa and in Tampa owns the M & B Products facility, which process and packages milk and fruit juice products. On Sept. 12, he said there was no structural damage to the dairy or facility, though power remained an issue. His family and employees were safe. His home in Thonotosassa just east of Tampa was on generator power and so was the farm. The Tampa-based processing plant was running on normal power. “Our challenge of the moment is getting the supply chain coming from outside the state rolling,” McClellan said, right before he got on a conference call that morning with Mike Joyner, Florida’s Deputy Commissioner of Agriculture, to a devise a way to assure outside suppliers and truckers that Florida, though in recovery, is ready to get business back started. “We are also working to receive raw milk as soon as possible so as to help the Southeast Milk Inc. That's challenging considering the schools themselves don't know who and when they're open,” he said. Andy Robinson Sept. 12, one day after the storm, was back in the field digging peanuts again, which was something Irma put a stop to Sept. 9. “Peanuts that were on the ground in this field during the storm are in good shape,” he said. The Robinsons farm and co-own a peanut buying and shelling facility in Williston about a 120 miles north of Tampa on Florida’s west coast. Though some fields that were ready to be harvested will have some potential yield losses due to Irma, for the most part the Southeast peanut belt from Florida up through Georgia and Virginia-Carolina region fared OK from Irma, with some locations actually receiving a good rain from the storm. Florida Commissioner of Agriculture Adam H. Putnam took an aerial tour Sept. 13 to survey areas impacted by Irma, including citrus groves in central and southwest Florida. “It’s still too early to know the full extent of the damage to Florida citrus. But after touring groves on foot and by air, it’s clear that our signature crop has suffered serious and devastating losses from Hurricane Irma,” he said. Michael Rogers is as the University of Florida professor and director of the Citrus Research & Education Center located in Lake Alfred, Fla. In his area, citrus fruit drop caused by Irma ranged from less than 5 percent in some groves to as much 30 percent in others. “There was a good bit of variability in fruit drop. In part it could be related to the row orientation and how the winds moved either down the row taking more fruit off the trees versus across a block where the outer rows took the biggest beating. We'll still need to give it a few days to get a better picture of how much drop most growers saw,” he said in an email late evening of Sept. 12. The research center, located about 60 miles east of Tampa, had minimal structural damage. “Our biggest concern for the research station is the lack of electricity and the rapidly rising temps in the greenhouses that hold valuable research plants. We also have lots of samples in freezers on backup generators, but we don't have enough generator capacity to save everything. So we'll lose some things, but I've taken steps to save the very important items,” he said. In an interview with Southeast Farm Press Sept. 12 and later in his blog Sept. 13, University of Georgia Extension pecan specialist Lenny Wells said Irma is the most damaging wind event ever seen by Georgia’s pecan crop, with virtually every orchard affected by its sustained tropical winds and gusts as high as 75 mph. He estimated 30 percent of what was a strong 110-million-pound crop is lost. If the weather holds, the rest of the crop should be OK as harvest begins for early varieties later this month and rolls into fall. “At this point the most significantly damaged orchards appear to be in the Valdosta area (located on the Florida line) and near Ft. Valley (located in central Georgia), where individual growers report thousands of trees on the ground. Most growers throughout the state report at least some trees blown down in their orchards in numbers ranging from tens to hundreds. Every orchard has limbs broken and a significant percentage of nuts blown off the tree,” he said. It appears to vary across Georgia, but at this time reports indicate the state’s cotton crop sustained considerable damage from Irma’s strong winds, knocking plants to the ground and mangling others with open cotton and closed bolls blown to the ground. Johnny Cochran farms in Worth County, Ga., in south-central Georgia about 70 miles north of the Florida line. Cody Mitchell is the farm manager for the Sunbelt Ag Expo in Moultrie, Ga., located in south-central Georgia about 50 miles north of the Florida line. He said cotton on the research farm took a big hit. Of the 200 or so acres planted there, 70 percent is blown over or twisted. Seth McAllister is the UGA Extension county agent in Terrell County, Ga., located in southwest Georgia about 50 miles east of the Alabama line. “We lost a lot of cotton that was open to knee high or so. I haven't walked many fields yet, but it looks like there were some major losses,” he said Sept. 12. 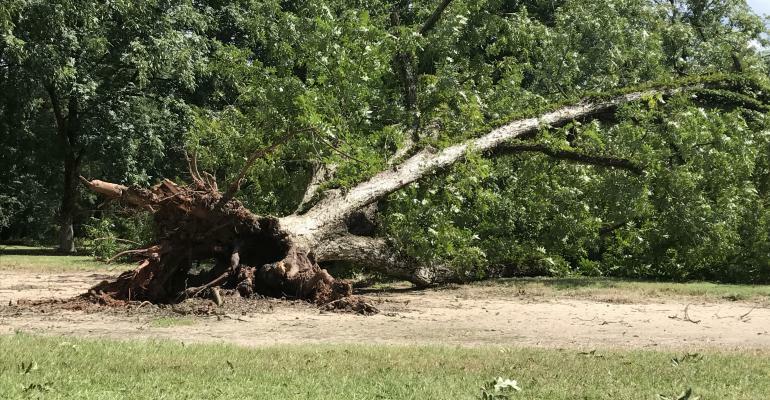 In southeast Alabama’s Wiregrass Region, which experienced the weaker west side of the storm, there is only minor damage to crops, said Brandon Dillard, area agent for the Alabama Cooperative Extension Service. The rain Irma brought was welcome. “Some peanuts that were ready to dig may lose some yield. Some cotton, a 100 pounds (per acre) or so, blew out and some lay down,” he said in text Sept. 12. Irma hit southeast Georgia, the hub of blueberry production in Georgia, the top blueberry-producing state. Back in April, the blueberry crop suffered a worst-in-memory late-spring freeze, which zapped the crop. Irma battered plants with heavy winds and rain. Michael Thomas farms blueberries in Pierce County with his father and brothers. He said new plantings took the worst hit, and Sept. 13 they had a crew in orchards straightening plants and staking them in hopes that they will reroot. Established, mature plants did OK, he said. Blueberry growers were advised to take a proactive approach in orchards to minimize potential long-term damage. Because of the impact on many crops due to Harvey and Irma, the USDA will survey and compile updated harvested acreage information in affected states. The information will be released in the USDA Oct. 12 Crop Production report. Harvested acreage information will be collected from producers in Alabama for Upland cotton, peanuts, and soybeans; in Florida for Upland cotton, peanuts, and soybeans; in Georgia for Upland cotton, peanuts, and soybeans; in Louisiana for corn, Upland cotton, rice, sorghum, soybeans, and sugarcane; in South Carolina for Upland cotton, peanuts, and soybeans; and in Texas for corn, Upland cotton, alfalfa hay, other hay, rice, sorghum and soybeans.